Do famous writers really abide by the rule? Indeed they do, as made clear by Pulitzer Price-winning author Michael Chabon in a special presentation on the website of The New York Times on November 18, 2016, not long after the publication of his latest novel, Moonglow (Harper). A final note: With this post, the Fairfield Writer’s Blog is going on hiatus and will be in read-only mode as of January 1, 2017. In the second of two pieces about editors and editing, the Fairfield Writer’s Blog is once again pleased to welcome novelist Maddie Dawson as guest author of our latest post. I thought I knew all about editing. Um, sure. But don’t we already know why death is bad? Could we just go with our gut feeling on this one? OK, so maybe they didn’t say precisely that, but trust me, it was close. I was always having to explain to editors that such people didn’t exist in the real world—or if they did, they weren’t in my Rolodex, and how would it be if I simply interviewed the sources I knew would have interesting things to say? “Well, if that’s the best you can do. . .” the editor would say. Then I started writing books, and the real fun began. I was sure I was ready for editing, ready for the teams of editors and copy-editors who would help me sharpen my prose, get to the true meat of my stories—and support my most confused and confusing efforts. At last I would have my own personal Maxwell Perkins! We would talk on the phone about plot points and adjectives! We would move commas around as though it were a team sport! I signed with Shaye Areheart Books, a division of Crown Publishing, which is a division of Random House, and I wrote three novels with them before the imprint was shut down in a belt-tightening move by Random House. After that, I wrote two more novels for Crown. Let me just say: I loved (and still love) my editors there! They are lovely, talented, smart women who were interested in my books and interested in me and my career, and we have had lots of great conversations over the years. Their job—and they were busy, busy, busy—was to discover authors, nurture their careers along by presenting their work and defending it to the very shadowy and scary Marketing Department, and then help to launch the book out in the world. They hired copy editors to go over the nuts and bolts and semi-colons and commas of the books. These were the ones who tracked down discrepancies (thank you!) and made sure my characters kept their same names and hair color throughout the book and that they didn’t put on their coat and then three paragraphs later put on their sweater. Then I signed my latest book with Lake Union, a division of Amazon Publishing, and found myself in a whole different world. There, not only did I have an acquisitions editor (the one who bought the book and deals with all the nuts and bolts with marketing and publishing—sort of like a general contractor who keeps tabs on my book as it moves through the system), but I also was given a developmental editor. She was a professional freelance editor who edits manuscripts full-time and doesn’t have anything to do with other aspects of the book’s publication. She worked on the book for about a month. The manuscript, when I received it back with all its Track Changes, seemed to me to be ablaze with red lines connected to bubbles with questions in them. No page had seemingly escaped her careful scrutiny. I have mercifully forgotten the precise number of changes and suggestions and comments she made (a number Microsoft Word so cheerfully pointed out to me). . .but trust me on this: it was in the thousands! Thousands, I tell you. I had to take to my bed. In the letter that accompanied these massive changes and suggestions was high praise for the book. What?? She actually liked it, and yet she needed to see approximately 56,587 changes? There was also the assurance that this was MY book, and that I didn’t have to do anything. I could simply press a button that said REJECT CHANGES, and go back to my life. But of course I didn’t do that. After gnashing my teeth and informing my friends and family that I couldn’t ever see them again, I set to work. Day after day for three weeks, I sat at my dining room table in my bathrobe, going over the manuscript, weighing my editor’s suggestions, rewriting scenes, rethinking characters. I probably took 98 percent of her suggestions, because when I thought about them, they made sense to me. She had a distance and a perspective on the book that I simply couldn’t have, being so close to it. She had studied the arc of my story—an arc I’d been constructing but not ever sure was working correctly—and she knew when it faltered and when it needed oomph, and when the reader needed some sparky scene to keep her from turning off the light and going to sleep. I found myself living for those moments when I’d come across one of her comments that would say: “Oh my God! I love this scene!” or even “I’m weeping here!” When she told me she actually loved this book, I wanted to send her roses and caviar and perhaps ask her to come live with me in my house. By the time the book went to its next stop—copyediting—it was in mostly good shape. 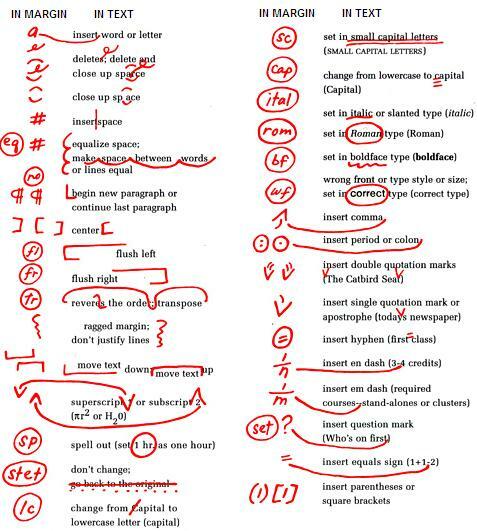 The copyeditor did all the fact-checking that was needed, and when I went over those edits, I learned a few more things I was grateful hadn’t slipped through the cracks. And then—voila! The Advanced Reading Copies (known as ARCs, or galleys) were printed up, right before the final proofreading took place. Although the ARCs are close to what the final book is like, in my case, there were still a couple of things that changed—nothing big, but things I added and took out as I went through the final proofreading stage. Having my book be so thoroughly edited has been nothing short of amazing. It’s like having a partner, someone who is so much on your side, who cares enough about what you’re doing to argue with you, make hard suggestions, listen to your concerns—and ultimately help you figure out the best answer. The other day, when the first copies of The Survivor’s Guide To Family Happiness landed in my driveway by way of the Fed Ex guy, I opened the box with excitement—and sat immediately down and started re-reading it. With pleasure. Editor’s Note: The Survivor’s Guide to Family Happiness by Maddie Dawson (Lake UnionPublishing, 384 pp.) will be published on October 25, 2016. Unless you opt for the self-publishing route, as a writer you must realize that the editor is the ultimate gatekeeper to your words appearing in print. That’s true whether you submit your work to a website, a newspaper, a magazine, or, via a literary agent or directly, a book publisher. Do not think of the editor, however, as just an obstacle to overcome. She or he also can be—and in the best cases always is—an ally, one whose goal is to help you make your writing as good as it can possibly be and then get it in front of others to read. So it may behoove you to broaden your understanding of how and why editors do what they do. Fortunately, the past few months have offered three notable portraits of editors at work. The latest is Robert Gottlieb’s memoir, Avid Reader (Farrar, Straus and Giroux). Gottlieb is a publishing giant, having worked as a top book editor at Simon & Schuster and, over two separate terms, Alfred A. Knopf, in between which h e succeeded the legendary William Shawn as editor of The New Yorker magazine. The roster of authors whose work he shepherded into print includes Toni Morrison, John le Carré, John Cheever, Michael Crichton, Robert Caro, Nora Ephron, Katharine Hepburn, Lauren Bacall, Joseph Heller and Bill Clinton. The Fairfield Writer’s Blog has purchased Gottlieb’s book but has not yet read it. The universally positive reviews have promised a healthy dose of editorial wisdom amid Gottlieb’s stories about polishing the prose of authors from both the literary and celebrity ends of the publishing spectrum. One for-instance, from Dwight Garner’s review in The New York Times: “Throughout his long career, if one of his writers was blocked, Mr. Gottlieb liked to tell him or her, ‘Don’t write, type!’ ” Indeed, the simple act of putting something, anything, down on the screen or paper often acts as a trigger to getting your creative juices flowing. The third 2016 exploration of the editor’s job is not a book. It is a movie—“Genius” —starring Colin Firth as editor Maxwell Perkins of Scribner’s and Jude Law as author Thomas Wolfe. The independent film is adapted from A. Scott Berg’s award-winning 1978 biography, Max Perkins: Editor of Genius (Dutton). It was released in U.S. theaters in June, to so-so notices, and came out on DVD earlier this month. Perhaps it takes an editor to fully appreciate the inherent drama of a famous author-editor relationship. The FWB recommends clicking through to “I Read It at the Movies,” in which Gerald Howard, executive editor at Doubleday (where he worked with FWB friend James Kaplan on the second volume of Kaplan’s monumental biography of Frank Sinatra), offers just such an appreciation of “Genius” in The Chronicle of Higher Education. Howard’s essay expresses the challenges and rewards of his and his colleagues’ craft in far more refined prose than the FWB marshals here. Should you decide to make a deeper study of the editor’s world, Berg’s life of Perkins is the place to start. It won a National Book Award for biography. A companion memoir to Gottlieb’s is Michael Korda’s Another Life (Random House, 1999). Korda worked down the hall from Gottlieb at Simon & Schuster, editing writers as diverse as Jacqueline Susann, Larry McMurtry and Richard Nixon. OK, so your interest is in writing, not reading about or watching the depiction of what Howard, in his essay, refers to as “the sausage factory” aspects of putting words into print. Editing—what’s the fun in that? Note: This is the first of two posts about the editing experience. Coming up, a veteran author has her latest book edited by her new publisher. Writing short. Consider the significance of the two-word sentence: I do. Today, for many, short writing is a tweet (140 characters) but Clark reminds us that short writing has played a significant role in “human culture, over history, to say some of the most important and most enduring things.” Clark notes, “[I]f you take the shortest versions of the Hippocratic oath, the 23rd psalm, the Lord’s Prayer, any Shakespeare sonnet, the preamble to the Constitution, the Gettysburg Address and the last paragraph of Dr. King’s ‘I Have a Dream Speech’ and add up the total words, it’s less than 1,000.” The Lord’s Prayer contains 66 words, the Gettysburg Address contains 286, and the preamble to the Constitution was crafted with just 52 words. Six Word Story Every Day (also on Facebook) offers an interesting look at writing short. A story told in just six words. Last July, on my birthday, I began keeping a six-word-a-day journal. My entries reveal a range of daily events, reflection, contemplation, joy and sadness. The Fairfield Writers Blog has written several times about the value of hiring an independent editor on your path to finding an agent and publisher for your manuscript. Your options are many. You might enlist a writing partner or a colleague from your writers’ group. Or the presumably-more-experienced leader of your group. You might engage an editor whose reputation comes via word of mouth from someone you trust, or you might approach one of the many who advertise in the classified sections in the back pages of the writers’ magazines. Or, in 2015, you might decide it is time to spend top dollar on a seasoned professional who has worked as an editor at one or more major publishers. A person with a proven track record of discovering future bestsellers and guiding renowned authors in the highbrow literary universe. Here’s the story of one of those editors, and what he and those like him can do for your writing. When Richard Marek received the phone call telling him that an editor at Atheneum had accepted his novel Works of Genius for publication in 1987, “it was one of the great days of my life,” he told the Fairfield Writer’s Blog. Not long after hearing the happy news, Marek continued, the editor “wrote me a nine-page letter, saying, here are the mistakes that you’ve made. You have to fix this. It was humiliating because they were things I would have caught in anybody else’s novel. But I just missed them. They were part of my soul,” Marek said with sarcastic emphasis. Even one with an inside-publishing resume like Marek’s. Marek spent four decades in the upper editorial elevations of the New York book-publishing world. Among the houses he worked for: Macmillan, World Publishing, The Dial Press, G.P. Putnam’s, St, Martin’s Press, E.P. Dutton and Crown. Among his various positions: acquiring editor, editor, editor-in-chief, publisher, president and editor-at-large. He edited books by such literary lights as James Baldwin and John Yount. He gave bestselling thriller writer Robert Ludlum his start by purchasing, editing (for more than two years) and publishing The Scarlatti Inheritance for Dial, then continued to edit Ludlum through the debut of the writer’s most famous character in The Bourne Identity. (Jason Bourne was first played, on TV, by actor Richard Chamberlain, and later in films by Matt Damon.) He ran his personal imprint, Richard Marek Books, at several houses. Today, at 81, Marek hones the works of aspiring authors as a member of The Independent Editors Group (IEG [www.bookdocs.com]), a consortium of experts co-founded by his longtime editorial partner, the late Joyce Engelson, and the late Jerry Gross. He also has ghostwritten numerous books, including Trisha Meili’s bestselling I Am the Ce ntral Park Jogger. 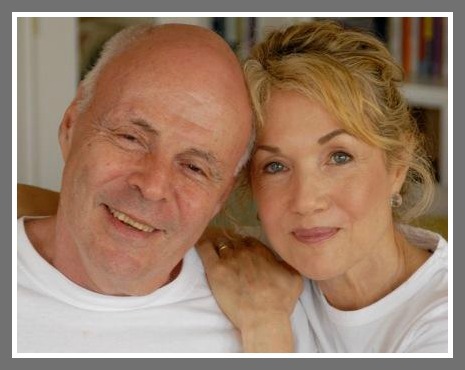 Most recently, he and his wife, Dalma Heyn (right), co-authored A Godsend: A Love Story for Grownups (Prospecta Press, 2012). On a late-summer afternoon in our neighboring town, Westport, Conn., Marek discussed the role an independent editor such as he can play in helping you move closer toward your goal of getting published. And he shared several instructive tales and writing tips from his long career. How writers find him. “The writer thinks the book is done,” Marek says. “She or he will probably send it to an agent, if she has any contacts at all, or find agents to submit to in Publisher’s Marketplace or another directory. And the agent will call me or one of my colleagues. But the agent will have not taken on the book. The agent will say, ‘I might do something with this if. . .’ and we rarely talk about what the ‘if’ is. I don’t like that. I want to see the book with fresh eyes.” A writer also can approach an IEG editor directly through the website linked above. How do you charge? “I charge blanket fees. But I charge in two ways. I charge for a reading and report on the book. Those are very careful. Here are the strengths, here are the weaknesses. This is what’s wrong with the characters. Here’s where the plot falters. Maybe you can fix the plot. For that kind of report I charge depending on the length of the book. What makes a good ghost. “It’s somebody who can capture the voice of the person he’s ghostwriting for. I think one’s own interest in the subject and one’s own interest in the person he’s working with also matter. Trisha Meili and I got along wonderfully. The [Central Park] attack made it impossible for her to stay on a narrative. So we worked on a very detailed outline. I’d say, ‘No Trisha, that’s for the next chapter. You talk here about this.’ I’ve pretty much given up ghost writing. It pays well, but it’s a lot of work. Does bad writing mean bad storytelling? “Not necessarily,” Marek says. “One of the worst written books that I can remember is An American Tragedy. But it is great storytelling. And that’s why [Theodore Dreiser] was so successful. He was a terrible writer. “So was Robert Ludlum. Terrible! Bob was a play producer and he and his wife were both actors in New Jersey. We had a Robert Ludlum school of bad writing. And our favorite part of that school was redundancy. Bob wrote sentences like, ‘The soldiers stood rigidly at attention.’ And I would call him and say, ‘How else can you stand at attention?’ Or my favorite, ‘The general made an audible noise.’ Try to make an inaudible noise. But Bob was a good storyteller and had this knack of finishing chapters that was really terrific. A novel that did not need editing. “I was the acquiring editor of The Silence of the Lambs by Thomas Harris. I was crazy about [Harris’ previous book] Red Dragon. It has this great character, a minor character, a minor character in both books. Hannibal Lecter. Minor is not the right word. A subsidiary character, although he takes over the book.” By the time the full manuscript entered the production process, Marek had left the company. “Tom wanted me to read it anyway. I wrote him back and said ‘This is wonderful.’ The Silence of the Lambs didn’t need editing. Obviously one could have changed some sentences. “The mistake people make is concentrating on the plot and not concentrating on the characters. Everybody has idiosyncrasies. And most writers don’t write them in. . . .
Why you can’t get your book accepted. If a manuscript has good writing, good characterization and good storytelling, what’s going to keep it from getting sold? That warning to all of us who aspire to be published came from our local writing guru Carol Dannhauser, who prefaced her remark by pointing out that there are a lot fewer editors working at magazines and book publishers than there used to be, and that those survivors are overwhelmed with submissions. So the question arises: Can we increase our chances of having our writing accepted for publication if we have a better understanding of the editors’ perspective? Perhaps. It certainly cannot hurt. Here, then, is a random survey of sources where you can increase that understanding. What specifically is it that attracts you to a story, a writing style, or a cast of characters, that eases your mind over taking a chance on an unknown author? What is the one thing that will turn you away from a book every time? Name [two] things we writers can do to our manuscripts to make your job easier. Tartt: Do you work with all writers the way you work with me? (Which is to say, not really commenting until you have the whole manuscript in hand.) Or is it different with different writers? Pietsch: . . .Every edit is different. Some writers like to show a chapter at a time or even individual scenes, as they go, for comment; I’ve worked with writers who wanted to read a passage over the phone just after they completed it. Others want to write in total privacy, not revealing a single thing until it’s finished. Sometimes editing consists primarily of a letter asking questions about plot elements, or about pacing, or character, and sometimes it’s entirely line-by-line comments on language. . . .Editing is only useful if the writer finds it to be. And some writers really don’t want an editor’s help at all. Martin Amis told me once that he’d rather have his own mistakes than an editor’s fixes—an opinion that any writer is entitled to! Tartt: I’m with Martin Amis on that. I’d always rather stand or fall on my own mistakes. There’s nothing worse than looking back, in a published book, at a line edit or a copy edit that you felt queasy about and didn’t want to take, but took anyway. Editor biography & memoirs. Want to read more about editing and editors? Begin with Max Perkins: Editor of Genius, A. Scott Berg’s monumental 1978 biography of the remarkable shepherd of many great 20th century writers at Charles Scribner’s Sons. Perkins guided F. Scott Fitzgerald through The Great Gatsby, cleared the way against in-house objections to profane language in Ernest Hemingway’s The Sun Also Rises, convinced Thomas Wolfe to cut 90,000 words from Look Homeward, Angel, helped pave the way for Marjorie Kinnan Rawlings’ Pulitzer Prize winner The Yearling and Alan Paton’s Cry, the Beloved County, and steered first-time novelist James Jones away from one work-in-progress to the beginnings of From Here to Eternity, which won the National Book Award after Perkins had died. Michael Korda—a successful author of a diverse collection of nonfiction books including, most recently, a biography of Lawrence of Arabia—told the story of his many years as editor-in-chief at Simon & Schuster in Another Life: A Memoir of Other People (1999). Korda edited as diverse a list of authors as you can imagine, from Larry McMurtry to David McCullough to Jacqueline Susann to Ronald Reagan. Another Life is entertaining as well as informative about editing and publishing. 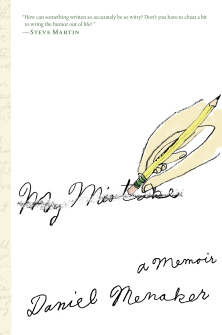 Finally, check out Daniel Menaker’s recent memoir My Mistake (2013). Menaker was an editor at The New Yorker, principally but not exclusively working on fiction, before moving into book editing at Random House. His book weaves the story of his career with his moving personal story about him and his brother. On pages 110 and 111 of My Mistake, he reprints the first two sentences of the original manuscript of a New Yorker book review by the renowned psychoanalyst Robert Coles, followed by the version that appeared in the magazine. The excerpts are an object lesson in the editor’s role in the clarification of prose. Menaker allows that it is “an example of the heavy work that editors sometimes had to do.” You get the sense that he wishes he did not have to wield so detailed a blue pencil.